Kate Breen – Honeysuckle Fizz and Wattle Seed Cake followed by a game of gum-leaf whistling to scare the possums! Kathy Chaudhry – (G)oing on an (U)ndeniably (M)agical adventure in their (N)atural surroundings to (U)ltimately find a birthday (T)reat for everyone! Maybe flying in (B)utterfly boxes or (A) fun time on (B)rilliant spider web swings! (I) wonder what (E)xcitement they\’ll (S)hare along the way…(MAY) be (G)oing (I)nside the (B)ush for (B)irthday cake to (S)hare! Shelley White – I think that they would collect nectar from the blossoms and honey from the bees to make tasty birthday treats to celebrate with all of their bushland friends. Decorating the party with bottle brush and wattle and having fun party games like gum nut bowling and seed pod boat racing. Mary Eddy – They will give everyone a box filled with shredded paper and when the kids dig deeper they will find lots of treasures like a lot of the things mentioned above. But the most special thing is an invite to their magical 100th birthday party. Jessi Deakin – By hitting the local bush dance and doing ‘The Nutbush’ with Little Ragged Blossom and steering clear of the big bad Banksia Men of course! Bec Lynch – Definitely old games such as frog diving and seahorse racing and perhaps some new ones like vine sliding and cassowary racing!! Plenty of time for nut babies to come up with lots of fun things to do when they are 100! Brooke Healy – Using logs as roller coaster trains with all the gum nuts and bush land friends through the crevices of Uluru landing with a mighty splash in one of the pools formed by the overnight rain. Melissa Grazules – I was always told as a little girl that when there were heaps of gumnuts on the ground ( under a gumtree) they were all the gum babies hats that had been left behind after a party so I imagine this would be the state of the ground after celebrating long into the night with all their bush friends with music. Catherine Stein – Go for a fly on Mr kookaburra’s back swooping through the trees and scaring all the villains. Then a big party with all the bush folk and lots of singing and dancing! Share in the birthday fun as we celebrate the ‘birth’ of our little Aussie bush fairies, the Gumnut Babies. When May Gibbs’ book hit the shelves on the 5th December 1916, these adorable little characters captured our hearts and have remained there ever since. To enter, complete your details in the form below and answer the question below. Our ten favourite answers will each win a prize pack. Entry is open to Australian residents only. Competition closes Tuesday 20th December 2016. Full Terms and Conditions below. 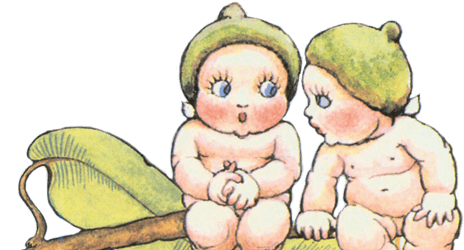 Gumnut Babies are kind-hearted but full of mischief, how do you think they'd celebrate their 100th birthday? The competition will be open from 5.00 PM Australian Eastern Standard Time (“AEST“) on Tuesday 13th December 2016 and will continue until 11.59 PM AEST Tuesday 20th December 2016 (“Promotion Period“). This is a Competition of skill and chance plays no part in the determination of the Winner with ten (10) Winners awarded one of three Major Prizes. Subject to the Entrant complying with these terms and conditions, the first ten valid Entries selected will each win one of ten Major Prizes. 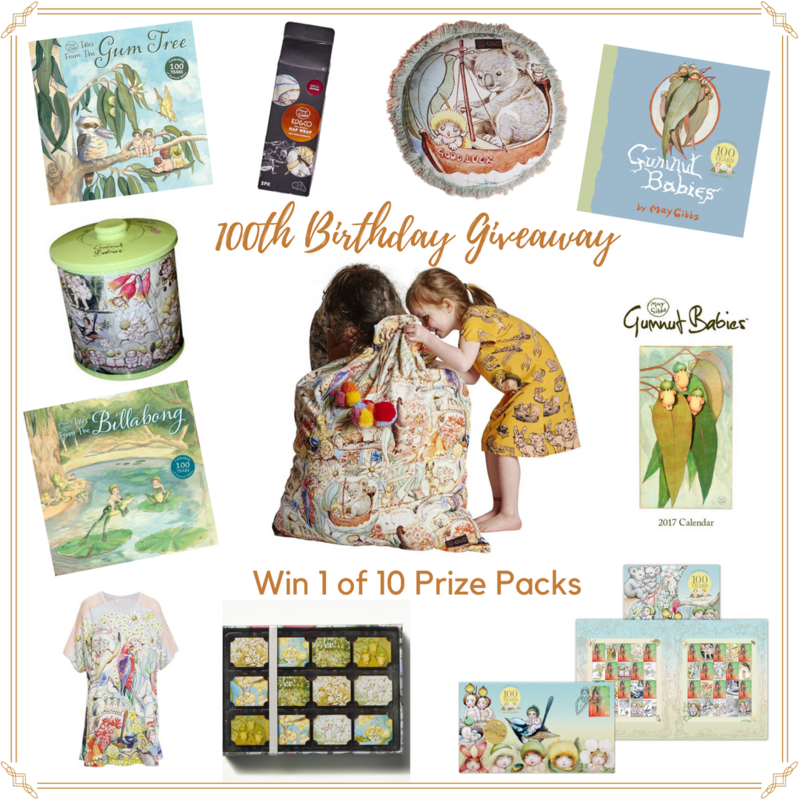 There will be ten Major Prize winners selected by the judges, based on skill, and the winning entries shall receive one of ten May Gibbs Gumnut Babies 100th Birthday prize packs. The Prize Winners will be notified by email after the Prize draw and contacted via the email account provided on the Entry form. The Promoter accepts no responsibility for any tax liabilities that may arise from winning a major prize.